If you have tried something new to you this month you can link up here or if you are looking for inspiration check out the great variety of new skills such as chicken raising and crochet that your fellow bloggers are having a go at. 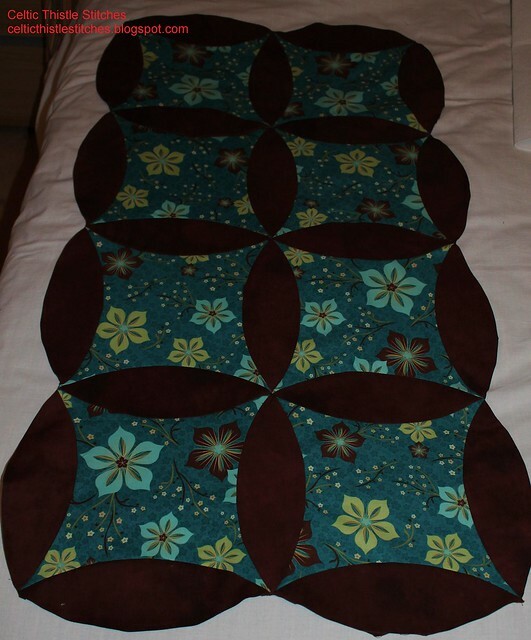 Although not entirely new to me as I have attempted a Drunkard's Path block many moons ago, the closing date for Rikka's Curved Seams Challenge is this Thursday, so I set aside some time this weekend to try and get cracking on my entry for the challenge. I don't know why but I have chopped and changed my mind so often on what to do for this challenge that I managed to leave myself hardly any time to do it. In the end I decided to dust off the Double Wedding Ring template purchased in a burst of enthusiasm a couple of months before my son's wedding nearly 2 years ago, and have a go at something with them. Obviously not a Double Wedding Ring anything as they are years ahead of my skills, but the pack contained templates for a simpler Orange Peel block that I thought might fit the bill. The templates were by Marti Mitchell and were very sturdy and straightforward to use. The instruction booklet that came with them was also straightforward. I like the fabrics, the turquoise floral was originally purchased for a bag pattern that I never got around to, but this whole project is just doing nothing for me. I really don't know why I am so underwhelmed by this, I can't even blame the amount of reverse sewing involved, although there was plenty of that, as I haven't enjoyed it since the first cut! Do you ever have projects like that? Even today I was thinking about scrapping it all together and starting something new, but I really would like to get this done and dusted ahead of the deadline for a change. Maybe I just need to leave it for a day and come back to it tomorrow. What do you think? Scrap it or Finish it? Great job on your curves sewing challenge! I'm a big fan of curves! Finish it! I think you did a great job and it's nice and neat. Mine on the BOM was terrible and took me another try at it. I really like the colors! This looks great! Sewing curves really scares me, which is a shame because I love the effect of curved piecing. I know what you mean about not loving some projects - I always love them at the chopping up stage but with some I fall out of love more quickly than with others. I almost always fall out of love at some point - I am very fickle - but equally almost always re-love it once it's done and dusted. Finish it and there is a good chance you will rediscover your love for it! Too many weekend interruptions, I'm not going to get to my challenge after all :o( I kind of had that 'not feeling the love' about my snowflake too, I'm sure there's something you can do to fall in love again, even if it does mean it has to do time in cold storage for a while! Oh, I really like the turquoise floral fabric, Fiona! Finish it! I have trouble not finishing something, even if it's not what I expected it to be. There's just something in me that makes me keep going... stubbornness??? And usually I'm really pleased I persisted, once the project is finished, even if it's something I'm not in love with. I can cross it off my list, knowing I've learnt something... even if that something is that I never want to do another of that type of project again... LOL!!! Having said all of that, I did pack away what was to be my Curved Seams entry.... a project for another day. I made the curves too deep and the seams puckered. I had already made a practice project and that's the one I'm entering. I feel for you, my dear. Nothing worse than lack of inspiration. I say step back for a day to fortify your will. You're a sewing whiz so I have faith you'll figure something out. Hugs! Have you a plan for the finished blocks? That might help to push you on....take a wee break. What a vibrant and eye-catching combination and "Huzzah" for going back to the curved piecing! Very pretty -- love the curves and the fabric. If you aren't feeling the love, finish it and donate it, someone will love it!